Yesterday I showed the amazing Calacatta Gold marble Kitchen in this home. Today it's time for the gorgeous Master Bath! 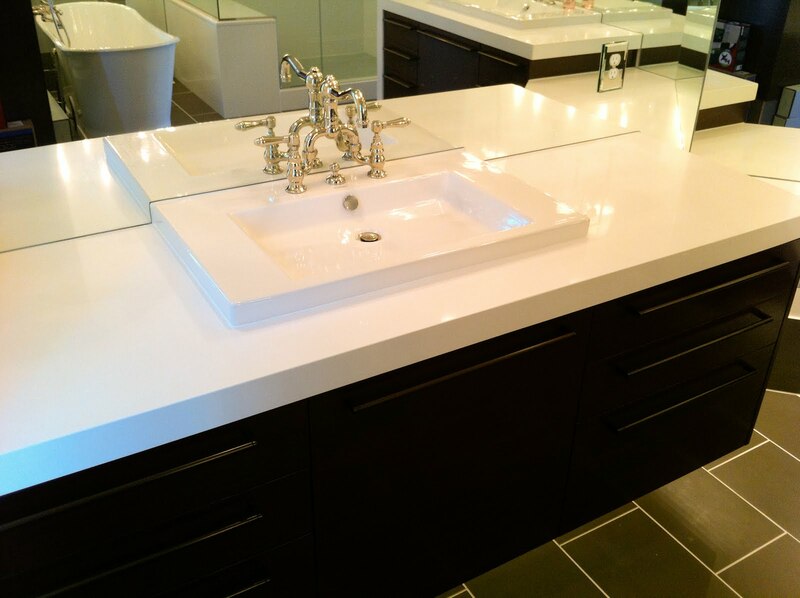 The countertops are quartz, she used one of the hottest colors from CaesarStone, #1141 Pure White. The edge detail on the vanities is a 3" Miter. 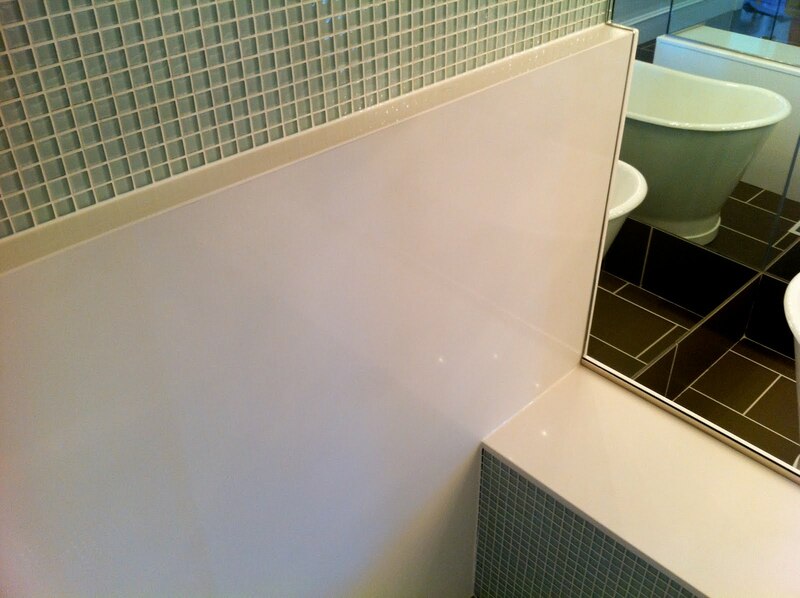 We did a Waterfall edge on the one end of the vanity (it's a Miter that goes down to the floor). 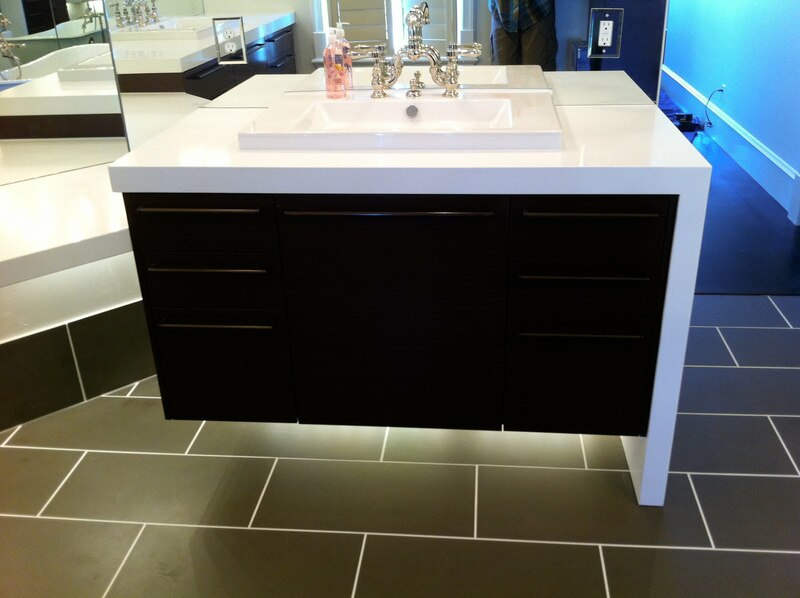 Notice how the vanities are "floating". I love the lighting underneath them, it's such a great detail. Again, keep in mind this was all designed by the homeowner. Didn't she do an amazing job? Another detail.....if you look close you can see the mirrors were cut around the large sinks. Beauty is in the details! 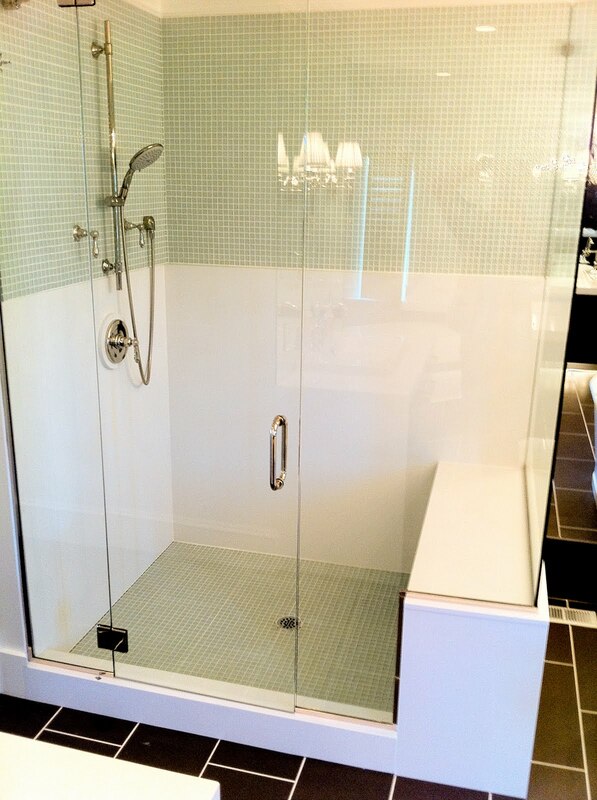 The shower also has slabs of Pure White CaesarStone. It was used as the wainscoting and then she did tile the rest of the way. I hate cleaning grout, so I really love slabs in a shower! All the curbing was done in the slab as well as the bench. Here's another detail, this one came about by accident. Notice the quartz circle behind the water lever? When we cut the hole for that we cut off of the plumbing specs, after the hole was cut they changed their fixtures. When the plumber went to install the lever the hole was too big. Instead of replacing the whole slab wall piece BJ & our template guy, Jake, came up with the idea to cut a circle out of the CaesarStone and set it on top of the wall. It was a great idea, and I think this looks even better now! I think this is the Master Bath of all of our dreams. :) Can you blame us for loving this job so much? There are still two really great baths left to show you in this home. Come back! Tomorrow is Whiteout Wednesday, so I'll post the pictures on Thursday. *All photos from MGS by Design. Okay THIS is my dream bath. Wow. Love the CaesarStone. I like that they used this surface instead of the marble. 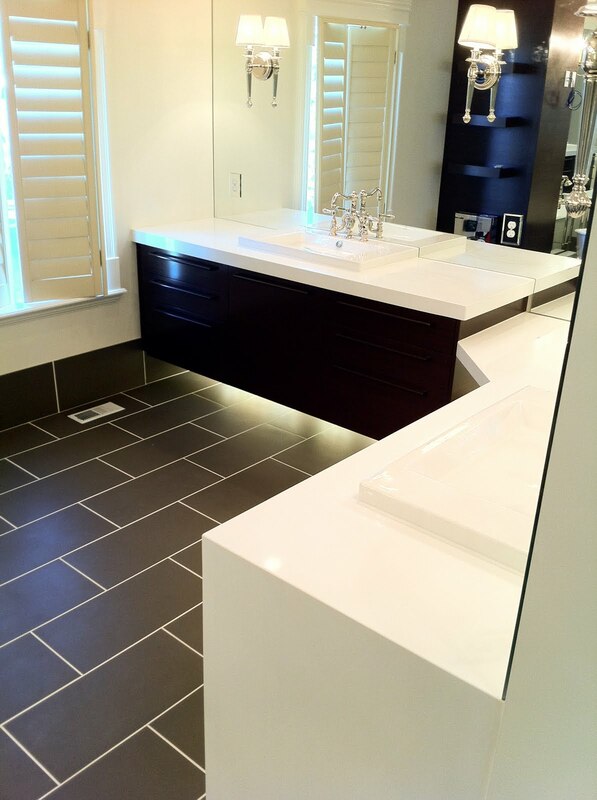 The floating vanities with the lighting underneath? Seriously? That's amazing! 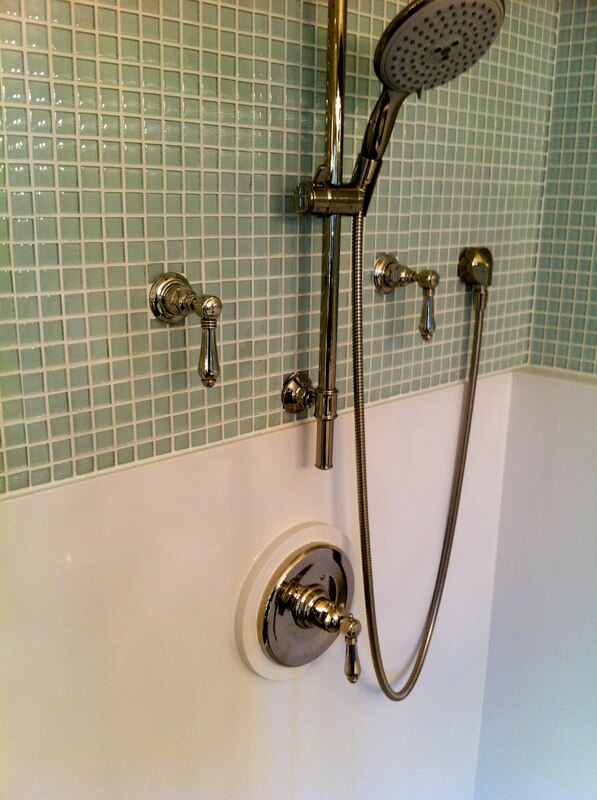 Oh and of course the shower and pedestal tub are killing me with their awesomeness. The kithen was great and this master did not disappoint!!! Gorgeous bath. I love every single thing about it! Hi Steph. I just discovered your blog recently and am enjoying it so much. A couple years ago I had asked my contractor about using slabs in a shower and was told there was a weight/support issue. So I'm loving this tile-on-top idea. Thank you. You really provide a great service. Holy bazolie! 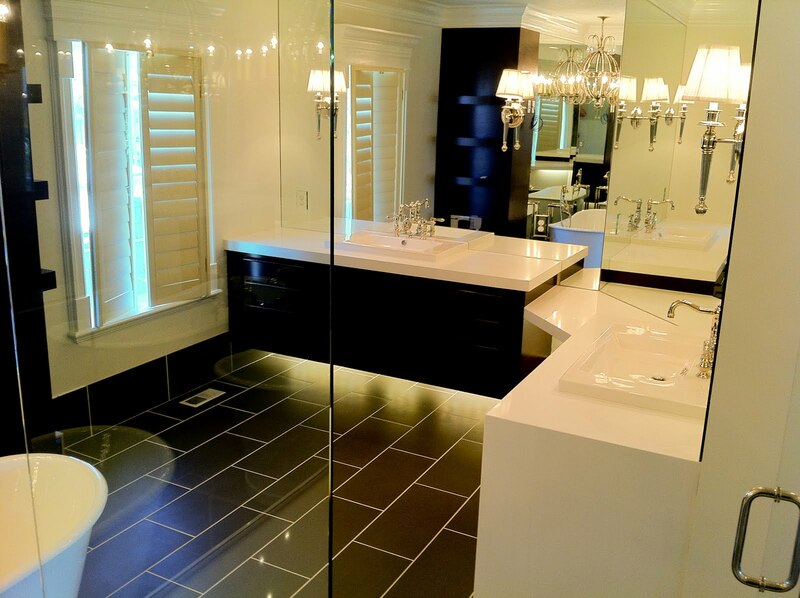 This bathroom is AMAZING!!!!! Beautiful! What is on the floor? I'm actually not sure what's on the floor. It's a porcelain tile of some sort, but I don't know where she got it. Sorry!